In our last entry, we wrote about Emerald Cut engagement rings. We mentioned how they were once the most popular cut of all rings, until about the 1990s, when everyone fell in love with the Princess Cut. One thing that both cuts have in common is they are known for there popularity as solitaires. While solitaires are beautiful, today's bride is more discriminating, wanting something more customized, something more unique in personality. 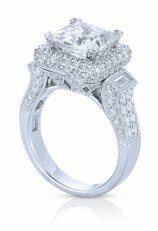 This beautiful Princess Cut diamond engagement ring from Vanna K offers just that. This piece features a gorgeous 3.0 carat center princess cut diamond. But it's not the center stone that defines this ring. It's the 1.80 carats of round diamonds that are micro-paved into the setting, coupled with the 0.25 carat baguette diamonds at the edges. It's the soft swooping sides, capped with the baguettes, all to support the center. It's the way this setting turns the ring into an heirloom, something to be cherished and passed down for generations to come. This is truly designed to be worn by a princess. Find this beautiful, one-of-a-kind ring (style : # 18RO4094WCZ) and other beautiful pieces at Vanna K.
Gorgeous ring, and overall nice product line as well. I love anything with this vintage or antique look that squeezes diamonds in tastefully at every possible millimeter.